The Niger Delta Conflict began in the 1990s in regards to the ongoing conflict between the militia groups of Nigeria, the Nigerian government, and the foreign oil corporations set up in the Niger Delta. The Niger Delta is a major producer of petroleum for nations such as the United States and because of the region’s richness in oil, cases of exploitation have been reported as the majority of the people in Nigeria live in poverty. By 1990, Nigeria became economically dependent on the petroleum trade, but the wealth from the oil does not reach the people as seventy percent of the population live on less than a dollar. The standard of living steadily dropped and the pollution around the Niger Delta had become steadily hazardous, but the responsibilities of the Nigerian government and the corporations for the well-being of the people are said to be minimal. The government, as well as the oil corporations, are said to be the main source of corruption as the land and people of Niger Delta are being exploited. The militia groups of the area had become increasingly violent as they try to fight back the corporations by stealing the oil and even kidnapping corporation workers for ransom. Some militia groups are said to be working alongside politicians, especially during election time, as black-market profit. The execution of Ken Saro-Wiwa and ten other human rights activists on November 1995 by the Nigeria government brought international recognition of the petroleum conflict in the Niger Delta. Saro-Wiwa was a writer and activist and had received increasing attention for his call of autonomy for the ethnic people of Nigeria. The eleven activists were tried in a kangaroo court and hanged. The outcries from international groups had led to increasingly criticism of the Nigerian government and the oil corporations, especially the Royal Dutch Shell Company. 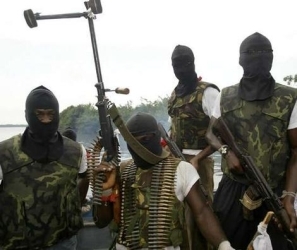 In July 2009, Nigerian President Umaru Yar’ Adua called for peace talks with the militia groups, which few had complied to, including the largest militia group in the region, the Movement for the Emancipation of the Niger Delta (MEND). “Nigeria: Ten Years on: Injustice and Violence Haunt the Delta,” Amnesty International Report (2005); Ed Kashi, Michael Watts, Curse of the Black Gold: 50 years of Oil in the Niger Delta (Brooklyn: PowerHouse Books, 2008); http://news.bbc.co.uk/2/hi/africa/4617658.stm; http://www.bloomberg.com/apps/news?pid=20601116&sid=anZURP3.wKhM.